Selfbuild with basement to the lower ground floor. Built using Izodom insualted and waterproof foundation formwork to the lower ground floor and the Izodom low energy 0.15W/m2K walls. Completed with crisp render finish externally and zinc standing seam roof. Custom build house on the banks of the river Nairn. Small basement storage area with the entire house built to Low Energy standard with 0.15W/m2K walls and pre-cast pre insulated ground floor slabs and hollow-core first floor. Selfbuild steading replacement, built entirely by the client. Built using the 350mm 0.15W/m2K Izodom elements with site assistance provided by the Econekt training team. Passivhaus standard self build with basement to the lower ground floor area. Low Energy, split level, self-build on the Isle of Mull. 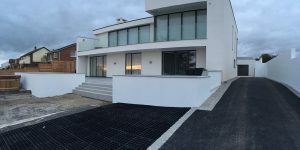 Built using the Izodom 350mm 0.15W/m2K walling elements with the Spantherm ground floor slab and an Icynene filled roof space. Supply of 200mm concrete core elements to the basement area of this new build holiday let. 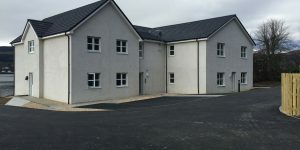 Built by Bespoke Highland Homes with site assistance from the Econekt training team. Large 136m2 retaining wall Built with the Izodom 300mm concrete core elements. Impressive wall build and pour by Bespoke Highland Homes, built on day 1 and poured on day 2. Passivhaus principle single storey new build dwelling house. Quite a complex build with cantilevered walling areas built with cast in-situ reinforced concrete beams as part of the 450mm Built using the 0.1W/m2K Izodom ICF and the Spantherm ground floor slab with pre-cast hollowcore roof deck. New build Certified PH with some very original design and detailing ideas. PH raft, 450mm 0.1W/m2K Izodom 450mm formwork elements. Low energy self build site using the 0.16W/m2K elements, still at 350mm width but produced from EPS and not Neopor. Bespoke 350mm 0.15W/m2K curved Izodom elements. Produced specifically for this project to allow simple and straight forward construction of the new curved extension. Low Energy extension to an existing farm house. 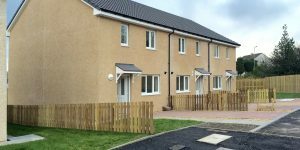 Design and build contract by MacIntosh Homes to complete 15 new build Affordable housing units for Oaktree Housing Association. Built using the 350mm Izodom low energy walls, achieving Silver Active energy standard. 2no. New build cottages built to a low energy standard using the 350mm 0.15W/m2K Izodom elements. True self-build for both new homes. Design and build contract by MacIntosh Homes to complete 8no. New flats for Fyne Homes. Built using the 350mm 0.15W/m2K walling elements with pre-cast concrete ground and first floor slabs. New low energy self build. Split level ground floor with the Izodom raft formwork to the lower retaining area and the Hanson JetFloor insulated 'block and beam' to the upper floor. Timber posi-joists elsewhere and Icynene filled roof space. Replacement dwelling with large concealed basement area on the ground floor. Built with the Izodom insulated and waterproof foundation system, using the 350mm 0.15W/m2K basement walls to first floor level, before having a timber kit built on top. 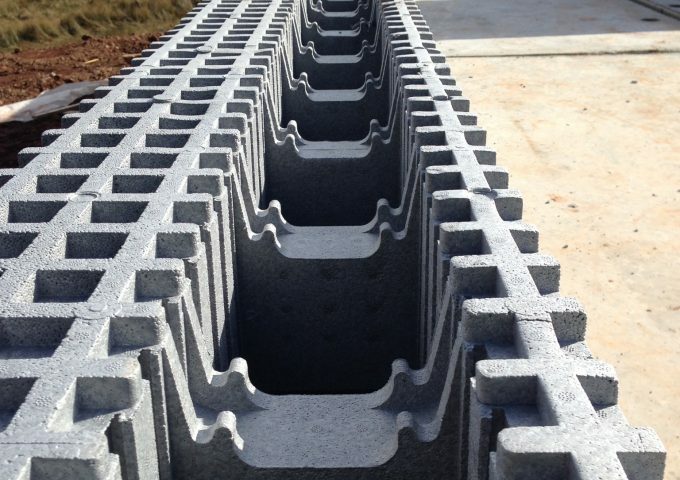 Design and supply of pre-formed, pre-cut ready for direct assembly Izodom insulated foundation formwork. This will be used to build a timber kit new-build from. Split level ground floor built with the Izodom insulated foundation system. 450mm 0.1W/m2K walls and pre-cast concrete mid floor. True labour of love for this self-builder. Large complex replacement dwelling built to a low energy standard. Full underground basement built with the Izodom waterproof foundation system and retaining wall elements. With insulated foundation to entire ground floor area. A stunning new build that's a testament to Heron. Large split level contemporary new build. Built using the Izodom insulated and waterproof foundation system, formed with a radius for this special project. Retaining to the lower ground floor and finished with 3 finishes externally. Another stunning example showcase for Heron. Large low energy new build by this self-build client. Built using the insulated foundation formwork and 350mm 0.15W/m2K external walls. 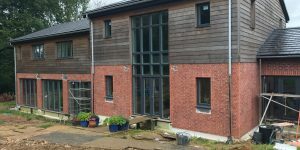 Passivhaus principle self-built new build dwelling house. Raft foundation formwork has been installed - walling elements in due course. EnerPHit extension to this villa. Utilising the insulated foundation system to the extension base and Izodom compliant walls to then be over-clad with an external wall insulation system (EWI). Bespoke insulated foundation system and compliant energy performance walls to be over-clad. Built from ICF to aid sound-proofing of this back garden recording studio. Izodom ICF used for structural walling elements to simplify the build of this predominantly glazed rear extension. Low energy Izodom 350mm 0.15W/m2K walls used for the first ever Izodom build completed within the UK. Low energy self build project with Passivhaus insulated foundation system, low energy ICF walls and timber posi-joist mid floor with rafter roof. Econekt are providing a shell contract service for this client in their old garden, taking works from site clearance to wind and watertight - a more unusual contracting only service for Econekt on this one. An architect designed house comprising of basement living accommodation with the driveway directly above. Low energy ICF walls with insulated foundation system. Full contracting service from Econekt taken from cleared site all the way through to externally completed shell. This will be a very neat and complex project with some exciting detailing and construction challenges for the team. Passivhaus principle self build with semi basement lower ground floor, pre-cast concrete floor slabs throughout and an external pallet to rival its Hungarian inspiration. This will be a very exciting self build with the Izodom Passivhaus foundation and ICF walling elements. A Passivhaus principle rear, side and front extension to this detached house in Orpington. 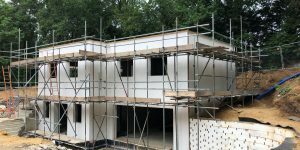 Econekt have provided the Izodom insulated foundation system and Passivhaus ICF walls for the rear and side extension, with the Izodom low energy ICF walls for the front. As with all supply only self builds Econekt provided our site assisted training program. 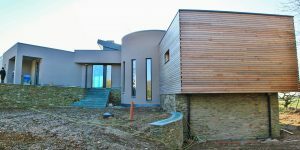 This contemporary self build will be built as a low energy shell contract by Econekt. 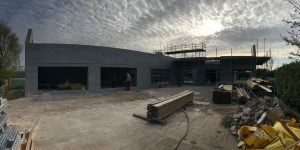 The Izodom insulated raft foundation will be used to form the ground floor slab throughout the main house and garage whilst the Izodom low energy ICF walls shall be used throughout the entire super structure. Econekt completed a final design, detail and shell contract on one of our first proejcts. 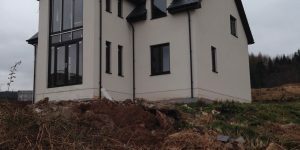 This unique self build was built to low energy standard with Izodom ICF throughout the structure and a pre-insulated and pre-cast ground floor slab provided by Creagh Concrete. Internally this home is a credit to the owners being entirely hand crafted to provide the feel of traditional German cottage. This low energy self catering and upmarket holiday cottage was the second phase for this Balmaha self builder. The holiday cottage has 8 individual rooms to cater for the Loch Lomond and Balmaha based outdoor enthusiasts. Built with Izodom low energy ICF, Spantherm insulated ground floor slab and Icynene spray foam insulation to the roof space - this is one low energy build with Passivhaus principles throughout.